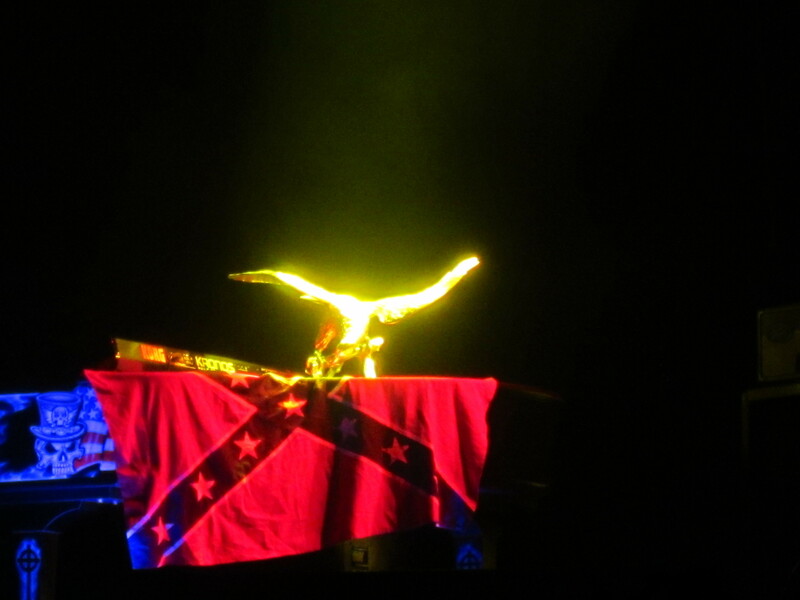 I was frustrated when I took this picture from the fifth row at a recent Lynyrd Skynyrd concert because I wanted a picture of the eagle that is the symbol of "Free Bird," one of my favorite songs of all time, but there was a big old rebel flag underneath it so I couldn't share it on my Facebook page. The reason I decided to share it now is because many people who look like me get offended when they hear other people say that today, in 2013, it still isn't safe to be black in America. I felt safe at the Lynyrd Skynyrd concert because I'm white. The rebel flag didn't tell me that it wasn't a place for people like me. I could relive my teenage years when I used to go to Walnut Creek in Raleigh, N.C., for all the country and Southern rock concerts with my redneck friends. Skynyrd for me was about being a rebel in general. I would blast "Sweet Home Alabama" on my car stereo every afternoon peeling out of the school parking lot and driving way faster than I should have on the country roads down to Jordan Lake. The third verse of "Sweet Home" always made me feel a little uncomfortable: "In Birmingham they love the governor / Now we all did what we could do." What is that supposed to mean? Are they singing about Governor George Wallace? The one who stood up for segregation? What does it mean to say "we all did what we could do"? Does that mean joining the mob to keep the black kids out of the University of Alabama? How could a black person not feel unsafe hearing the words to that song with some understanding of their context? I read on Wikipedia that for a few years Lynyrd Skynyrd took the rebel flag out of their set because they didn't want to be seen as supporting racism. But their fans thought they were selling out to "political correctness" so they harrangued and harrangued until they brought it back. And they said on their site something about it being Southern heritage, not hate. Here's the thing. With something like a rebel flag, intent doesn't matter. If it makes black people feel unsafe, it doesn't matter how I see it; I don't have the right to tell them to get over it. It was the first time I'd had a friend in jail. I remember putting on a coat and tie and going to the magistrate to speak up for him at his arraignment. I got pretty choked up. They actually released him to me if I remember correctly. Because he had a white guy who could vouch for him. The other black dudes in orange suits didn't have white guys to speak up for them. So they had to stay in jail. In any case, I had an experience last week that was really convicting. Having had these matters on my mind since the verdict in the George Zimmerman case, I was driving through D.C. in a part where most people on the sidewalk are a different color than me. I had to get gas. So I pulled into a gas station. There were a bunch of black guys standing around in the parking lot. As I was doing my thing, I realized that I was moving more quickly and nervously than I needed to. And I realized that I felt unsafe. Because I was surrounded by black guys. I've been working on my racism for at least 15 years. My best friend is black. My first year in college, I was the only white guy at the black First Baptist Church in Charlottesville, Virginia. I've sung in gospel choirs with mostly black people. I've taught and mentored black kids who became close friends. I've made music with black people. My favorite theology and preaching professors were both black. So why the hell do I still tense up when I'm in a gas station parking lot just because there are some black guys standing around? I have a feeling that I'm not the only white guy who experiences these thoughts that I sure don't want to have in my head. I also have a feeling that the more pissy white people get when you talk about racism, the more likely it is that they think these kinds of thoughts all the time and don't want to be confronted about them. But I desperately want to unlearn these instincts because if I feel unsafe around someone else because they're black, I am part of the reason that the world becomes unsafe for them. Whatever the details of the actual physical confrontation that George Zimmerman and Trayvon Martin had, the whole situation was created because George felt unsafe on account of Trayvon's blackness. Trayvon, in turn, felt unsafe because he was being followed. And it turned out that he was right. He wasn't safe in his own neighborhood. Because he was black and it was a rainy night. Regardless of how bloody George Zimmerman's nose got and whether he had a reasonable fear that he might be killed, independent of the verdict itself, I don't think any honest person can say that Trayvon's blackness had nothing to do with Zimmerman's decision to stalk him, whatever happened after that. And I'm one of the however many million white people who get nervous when there are too many young black guys around, which creates an atmosphere of suspicion that effects the instincts that people have on dark and rainy nights, whether they're white like me or another race or a mix. The source of so much evil is people feeling unsafe and seeing others as threats instead of somebody else who feels just as unsafe. As a pastor, I have to say that Jesus came to do something about that. He was safe in heaven, but He left His gated community there to spend His life walking from one sketchy neighborhood to another. When he got nailed to a cross, it was more than just a payment for our sins. It was like God saying, "All those people who make you feel unsafe; well I'm one of them, that's why I got lynched." God takes sides on the cross; He's on the side of the people whose lives are actually unsafe because they can be crucified, as opposed to the people who don't go anywhere near the type of place where Jesus got crucified because they've devoted their lives to worrying about their safety and the safety of their kids. To take up your cross and follow Jesus means more than just doing "sacrificial" things for other people. It means you join the people who are unsafe. It means you do a lot of listening without speaking. It means you don't live in denial about the shameful assumptions you make about other people in the deepest corners of your mind. It means you ask God for help in unlearning the racially-triggered instincts that we've all had drilled into us against our wills by a complex amalgam of social forces. The only way for all of us to be safe is to be unsafe together. That's what the Lord's communion table is supposed to be about. I realize I'm not saying anything earth-shattering; but honestly it's not my place to be the great white mind that saves America from its race problem. We've already got a savior who's a black-skinned Palestinian Jew, and He's been trying to save us from our racism ever since Christianity became European civilization.